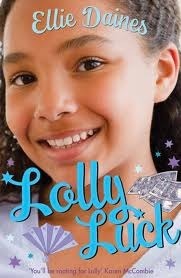 From Goodreads: Lolly is Lolly Luck by name, lucky by nature. She always wins magazine competitions, on scratch cards and any game you can think of. But when Lolly’s dad loses his job and then the family home, Lolly’s luck starts to change. And when she overhears her parents arguing, she learns a secret that will change her life forever. This is a really sweet and fun read yet still manages to deal with some real issues. It's a great addition to the 9-12 year range. I really liked the character Lolly. Her voice comes across as a typical 11 year old and I found her easy to relate to. I loved her family - especially her relationship with her sister. Once her dad loses his job things spiral downhill quite quickly and in a realistic manner. It's very interesting to see it through the eyes of an 11 year old - the impact it has on her everyday life and the fears she has about it. And reading between the lines you can really see the strain it has on both her parents - which of course leads to the revelation that changes Lolly's life completely. I was really surprised by the book - it really tackles some tough topics but does so in a way that keeps it appropriate for the 9-12 year old age range and makes it something they will enjoy reading. This will definitely appeal to readers of Jacqueline Wilson and Cathy Cassidy. Sign me up for more of Ellie Daines' books!